Where to find Belize City hotels near an airport? Where can I find hotels in Belize City that are near tourist attractions? 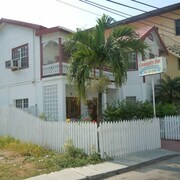 Seeking a comfortable hotel or apartment while you are in Belize City? You'll find around 10 hotels and apartments are located within a 0.1-kilometre (0.06-mile) radius of Belize City's heart. 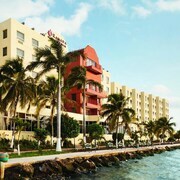 Within 1 kilometre (0.6 miles) of Belize City's downtown, you can find some great hotels, including the Radisson Fort George Hotel and Marina and Ramada Belize City Princess Hotel. Are you hoping to book economical hotels? You might like to consider the Coningsby Inn, The Bakadeer Inn and Bachelor Inn Hotel. 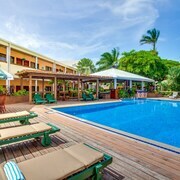 You could check out the Black Orchid Resort and the Best Western Belize Biltmore Plaza Hotel. 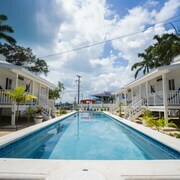 The Black Orchid Resort is located 25 kilometres (15 miles) away from the center of Belize City. 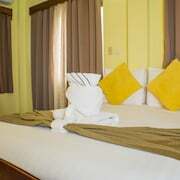 The Best Western Belize Biltmore Plaza Hotel, is positioned 4 kilometres (3 miles) away. The Island Magic Beach Resort Ltd and also the Caye Caulker Plaza Hotel are two other recommended options in Belize City. Looking for things to do? Consider spending a day or two exploring St Herman's Cave and Barquedier Waterfall, which you'll find in Good Living Camp, 65 kilometres (40 miles) to the southwest of Belize City. Expedia-listed Good Living Camp hotels and accommodations are the Sleeping Giant Rainforest Lodge and Jaguar Creek. 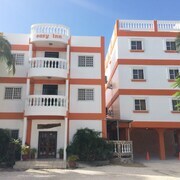 Or, you could consider staying in Fort George, 0.5 kilometres (0.3 miles) to the east of Belize City, where you can choose from the The Great House and Easy Inn. The Image Factory Art Foundation and Baron Bliss Tomb are popular points of interest to check out when visiting Fort George. If you love sports and like to watch games you might like to visit Isidoro Beaton Stadium, which is 70 kilometres (43 miles) to the southwest of Belize City. Book a hotel right near the action at the Super Palm Resort or the El Rey Hotel. Expedia's travel listing is also a great way to learn more about Belize City. Are there hotels in other cities near Belize City? 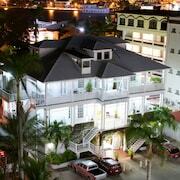 What other types of accommodations are available in Belize City? Explore Belize City with Expedia.ca’s Travel Guides to find the best flights, cars, holiday packages and more!